Sorry it’s been a while since I’ve posted. I’ve been hit with a wave of indecision again. My wife feels I need to complete something, get a quick win, focus on the ‘lowest hanging fruit’ so I can have that feeling of having completed a project again. And I’m inclined to agree. 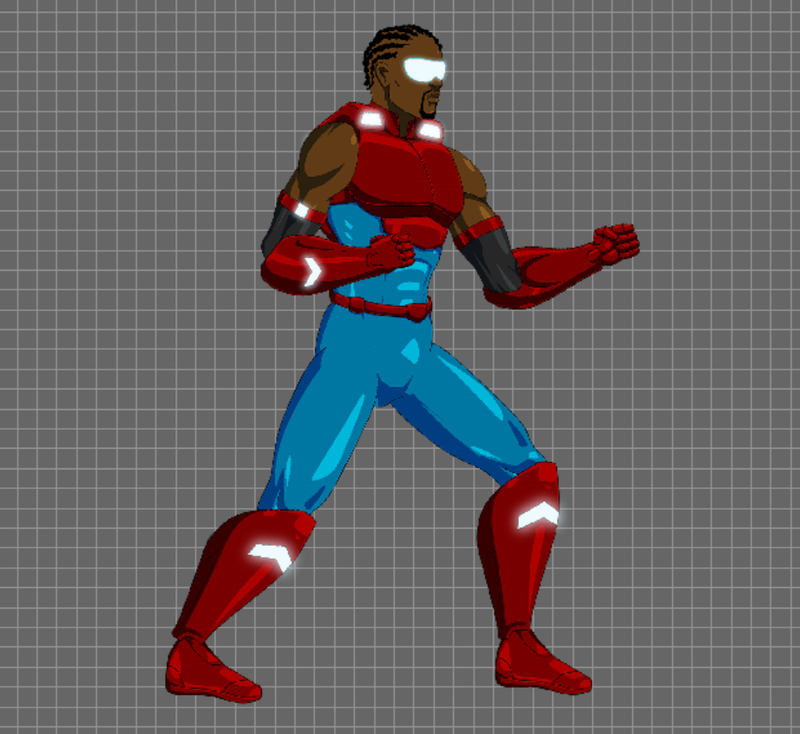 It’s easy for me to sit back and work on tweaking things on my Jet Dancer game. Just earlier today I found myself doing a bit of fiddling with animation speeds and transitions so she’d look a little better in motion and when coming to a stop. I’m really quite proud of what I’ve managed to build so far, but I started asking myself if I could see the light at the end of the tunnel for the Jet game, and honestly, I can’t. Sometime around the middle of last month, I started working on the game’s first planned boss, a gal named Striking Sphere. Like Jet, she’s a scantily-clad superhuman female warrior with a special weapon. But while Jet wields her rocket boots, Striking Sphere’s weapon, as her name implies, is a ball. Building her sprite parts was easy enough, as it always is, but when it came time to animate her, I started suddenly feeling extremely exhausted. Every time I opened the file, it was like I was in a blind haze trying to push myself to make things happen with her. I managed to produce an idle pose and a run cycle, but after that, even opening the file made me feel like I hadn’t slept in days. It was weird. I went and bought new markers and Bristol board to draw on, inspired by the many awesome traditional artists whose work I see on Instagram. But I didn’t actually create anything worthwhile. And now I’m once again wondering what it is I want to do. One can be a game developer, or a pro illustrator, or a graphic novelist, or a ZBrush 3D artist, but it’s highly unlikely one can be all those things at the same time, and yet, I keep trying. But while I’m doing all of this testing and learning, what am I accomplishing? When is the last time I finished something? Really put it out there? The answer is Jet Dancer #1, which I think I released in 2015: https://www.comixology.com/Jet-Dancer-1/digital-comic/144132. I was of course working on the 100 Girl Book as well. Full disclosure: while I have 47 girl drawings prepared for the book, only 33 of them are ‘new’ art (meaning, art that I actually produced in 2016 FOR the book) and the rest are old drawings I pulled up from the past to beef it up. Not a bad idea I suppose, but it goes against the original idea which was to challenge myself to make ‘100 somethings’. I also made the mistake of sharing most of them online (there are a few that no one has seen, but that’s like single digits at this point). A good idea for me would be to get back on that project and be more deliberate about it, stop trying to be ‘random’ and actually plan my drawings around themes, and not show a single drawing for the book until it’s done. That would mean more than half of the book’s content would be ‘truly’ new to viewers/buyers. I also got the idea of producing an e-book detailing my sprite making method. A lot of people seem interested, and it pretty much is my favorite part of this whole game-making shtick I’m on. The desire to bring my characters to life was the whole reason I wanted to be a game developer. I enjoy making sprites and I feel I could show others how I go about it fairly easily, but the problem is I use outdated and potentially pricey software to do it (like Flash…does that even exist anymore?) and while I’ve been thinking about finding alternative methods, the fact is Flash CS4 is the most flexible animation software I have at my disposal right now.